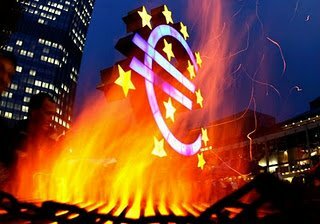 [M]any nations, after the storm of debt/banking crisis, will need to implement various government austerity programs, and households will commence debt deleveraging–a long and painful process. Spain formally became the fourth country to ask for bailout aid from the euro zone on Monday, June 25. Spain’s short-term borrowing costs nearly tripled at auction on Tuesday. Market participants expect Moody’s to further downgrade Spain’s sovereign debt to Junk status. Although no specific amounts were determined yet, WSJ reported that two external consultancies estimate Spanish banks’ actual capital needs could be at around €62 billion ($77.5 billion), and Cypriot Finance Ministry staff said they expect the total financing needs to come to €10 billion ($12.5 billion). Between the two, Spain is the one causing a lot higher anxiety. Spain is Europe’s fourth largest economy, which is larger than the other four euro bailout sisters—Greece, Ireland, Portugal and Cyprus–combined. And remember Spain already requested up to €100 billion ($125.7 billion) from EU bailout earlier this month to recapitalize its regional banks reeling from the collapse of its massive real estate bubble. 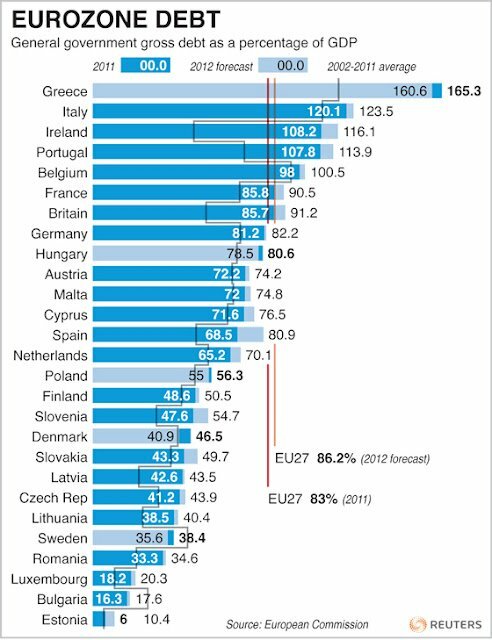 Sadly, judging from the current debt situation (see graph below), the Euro bailout train most likely will not stop here. Previously, we discussed how in the not so distant future, almost all countries in the world could end up in one of these three classes–bankruptcy, credit counseling or debt renegotiation due to decades of deficit spending. That also means many nations, after the storm of debt/banking crisis, will need to implement various government austerity programs, and households will commence debt deleveraging–a long and painful process. An analysis from McKinsey should illustrate this point more clear. 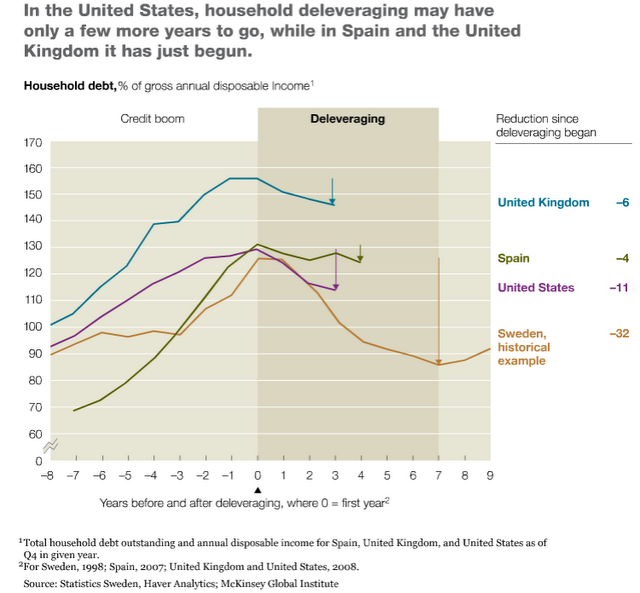 What’s more, “Significant public-sector deleveraging typically occurs only when GDP growth rebounds, in the later years of deleveraging.” And since today’s deleveraging economies are larger and under more challenging circumstances, the current deleveraging process could take longer than the historical experience of five to seven years from Sweden and Finland in McKinsey’s baseline. That suggests the world most likely could experience a long deflationary period. Some economists are starting to worry about the U.S. and Europe could face a coming Japanese-style deflation cycle. Although we don’t believe that is in the cards, since Japan is unique in its demographics, banking and government systems, we do think darker days are ahead, and America’s lost decade would at least get an extension.